About 200 km from Kolkata, on National Highway 2, an infrastructure project is proving that not all development in West Bengal has to be accompanied by controversy. The project, India's first aerotropolis, is coming up over 1,818 acres off the Durgapur steel city. An aerotropolis is a cluster with an airport at its centre and a city, whose economy is dependent on the airport, growing around it. Bengal Aerotropolis will have an airport, a township for 60,000 people, an IT park, a logistics hub and an industrial centre. It is being developed by a consortium that includes Singapore's Changi International Airport and infrastructure company IL&FS. The airport will commence commercial operations by next March, says Subrata Paul, CEO of Bengal Aerotropolis Projects, even though the runway isn't ready yet. "We are slightly behind," he concedes. FROM THE MAG: Delhi's IGI airport set to be world's costliest? They are grand projects, but being slightly behind, and then some, is something many airport projects have in common in India. Take Kolkata's Netaji Subhash Chandra Bose International Airport, for instance. The airport's 200,000 square metre integrated terminal, which was to be completed by 2010, will be ready only this year. Chennai's new domestic and international terminals, which were to be completed in 2010, will be commissioned in July. Mumbai's international terminal has been delayed by land issues and will be ready only in September, nine months late. Its development cost has shot up from Rs 5,826 crore, when the project was awarded in 2006, to Rs 12,380 crore, though this is partly due to widening of the project's scope to include construction of an air traffic control tower and an elevated road to the airport. But despite these problems, the airports story is largely a positive one. According to the Civil Aviation Ministry, the number of passengers handled by Indian airports grew to 160 million in 2012 from 40 million in 2002. The compound annual growth rate of 14 per cent for the 10-year period is one of the highest in the world, says the ministry. Infrastructure companies in the sector have much to look forward to, particularly by way of new projects. And the government's willingness to discuss regulatory problems and announce more projects promises to inject new life into the sector. The lack of a strong pipeline of projects has been bothering the industry for a while now. "Airports have seen success stories in the last few years. But that is a 10-year old story. No PPPs (public-private partnerships) have been signed since. We need projects, and bankable projects," says Manish Agarwal, Executive Director, Infrastructure Advisory, PricewaterhouseCoopers India. Now, the government is determined to bring its airport modernisation process back on track. It has announced that additional PPPs will be finalised for 10 to 12 existing and greenfield airports by the end of July. Work is scheduled to begin on three greenfield airports, including Navi Mumbai, the second airport in Mumbai. The government has also announced that two airports, possibly Delhi and Chennai, will be developed as hubs to make India a transit point. While they have welcomed the news, infrastructure developers want more information to formulate their strategies. "If there was some articulation in terms of the project structure and documents, land acquisition and environmental clearance, it would give investors confidence," says Agarwal. "It is definitely a positive step. But we would like some clarity on which airports the government is talking about when it says PPPs will be finalised by July-end. Clarity on how the development plan will be structured, such as the shareholding pattern in the PPP, will also be appreciated," says Sidharath Kapur, CFO, Airports, GMR Group. Kapur has good reason for wanting that clarity. In the Delhi and Mumbai projects, developed as PPPS, developers agreed to give between 46 per cent (Delhi) and 39 per cent (Mumbai) of revenue to the Airports Authority of India (AAI), which manages most of India's airports. This share is now being considered excessive as some airports are struggling. Delhi International Airport Ltd (DIAL), which operates the Delhi airport, has paid Rs 3,000 crore to AAI in the last five years in line with the revenue share agreement it signed in 2006. GMR Infrastructure, majority owner of the Delhi and Hyderabad airports, posted a Rs 604 crore loss in financial year 2012. This was on account of a loss of Rs 573 crore incurred by DIAL, which it blames on not being able to raise airport tariffs. In April, the airport regulator finally allowed DIAL to hike tariffs by 346 per cent, a decision welcomed by developers and investors. The draft 12th Five Year Plan targets an investment of Rs 50,000 crore by the private sector in airport development. This is based on the success of the 11th Plan, where the private sector brought in Rs 30,000 crore. Developers want Tier-II airports such as Ahmedabad, Amritsar, Chandigarh and Jaipur to be opened for development through PPPs. However, industry watchers are sceptical, attributing the success in the 11th Plan to projects in Mumbai, Delhi, Hyderabad and Bangalore. 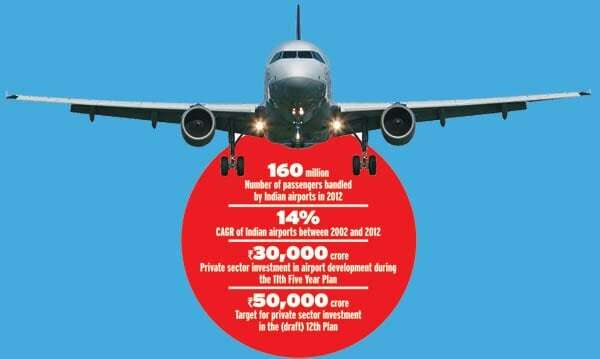 The 12th Plan draft also lays down an investment target of Rs 17,500 crore for AAI. V.P. Agrawal, AAI'S Chairman, says: "It is very pessimistic. We can do much more. Let the private sector come forward and develop greenfield airports. We will take only a minor share in it." But PwC India's Agarwal says that won't be enough. "Greenfield airports become viable over 30 to 40 years. The cash flow gap for developers in the interim will have to be taken care of. That's the challenge policy will have to address."